The Jeffersonville Tree Walk is a 1.5 mile, recreational walking route that celebrates the beauty, diversity, and beneficial nature of trees. The 140+ trees planted along this walking route represent over 70 species that are native to and/or suitable to be grown in Southern Indiana. Over the years, these trees will grow and develop into a rich canopy that provides shade for pedestrian comfort, helps improve air quality, reduces stormwater runoff, and beautifies the neighborhood. The plan for the Tree Walk recognized an ongoing need to reestablish a living, breathing tree canopy in the downtown area and a desire to create a unique recreational, and educational experience for residents and visitors alike. Beginning and ending at Big Four Station, the route takes you along the Ohio River, through historic residential neighborhoods and back to the heart of Downtown Jeffersonville. 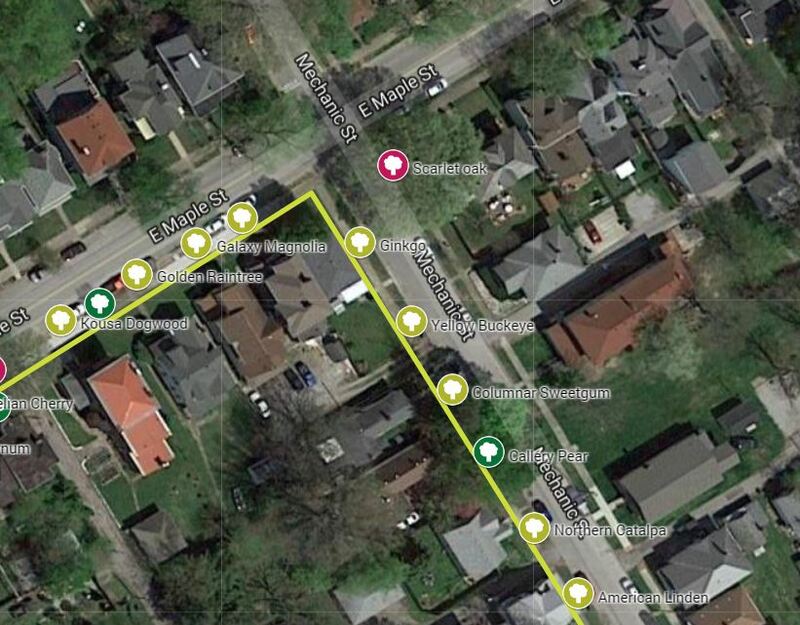 A shorter .75 mile loop is provided by a one-block shortcut on Locust Street. The trail is clearly marked with wayfinding signage at each corner and decals on the sidewalk indicate the common names of the trees along the route. For more information on the trees planted along this route as well as information on notable existing trees, please see our INTERACTIVE MAP. A small section of the map can be seen at the right. This map clearly notes each of the newly planted trees with a light green tree symbol. Clicking the symbol will bring up more information about the tree including scientific name and date planted. Other notable trees along the route have been noted with a dark green symbol and a few exceptional specimens have been noted in bright pink. Clicking any of these symbols will also give you some further information about the species and why the tree is notable. We hope you enjoy the Jeffersonville Tree Walk!